The Smart Villages concept aims to “help local communities address issues of inadequate broadband connectivity, employment opportunities and service provision in a clear and comprehensive manner”. It also aims to improve the attractiveness and well-being of inhabitants in rural areas. Social innovation can play a key role in the development of the full potential of rural areas. By working together and through social innovation, some communities have taken leadership of the provision of key rural services such as health, education, energy, mobility and other social services of key importance in rural, mountainous and remote areas where such services were of poor quality and often in decline. How can we capture their success in social innovation in marginalised rural areas and use it as an inspiration for all? How can we best support social innovation and Smart Villages in the future programming period? 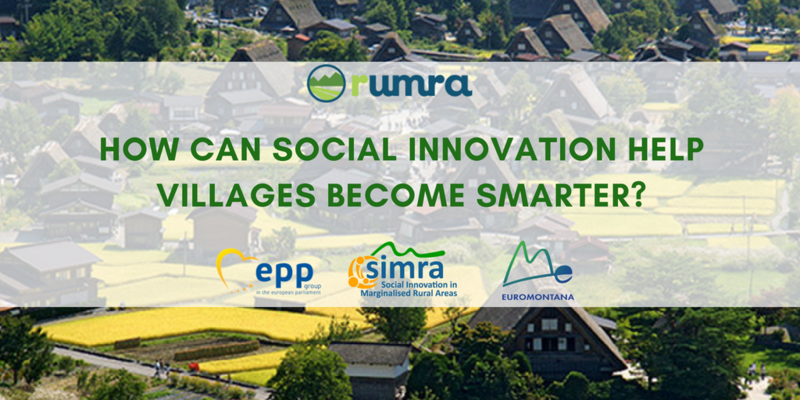 On June 27th, 2018, Euromontana with the RUMRA (Rural, Mountainous and Remote areas) parliamentary intergroup, and the Horizon 2020 SIMRA project organised a policy breakfast at the European Parliament, hosted by MEP Bogovič on the topic of social innovation in smart villages. 60 MEPs, officers of the European Commission, researchers and representants of local and regional authorities attended the event. The aim of the event was to clarify the concept of social innovation in rural areas and explore how policy measures could support social innovation through initiatives such as the Smart Villages for instance.